Tiger Woods wins The Masters. 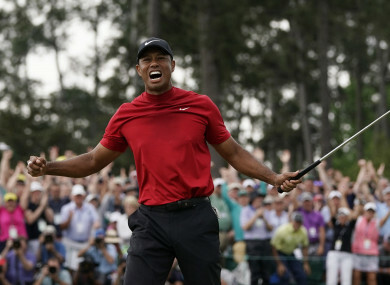 TIGER WOODS COMPLETED one of the greatest comebacks in the history of sport as his battling performance saw him become the 2019 Masters champion. The 43-year-old, who has undergone multiple surgeries on career-threatening back injuries and who has overcome setbacks in his personal life in recent years, started the day two shots behind overnight leader, Francesco Molinari. The American claimed victory at Augusta National for a fifth time on a score of 13-under par, finishing one shot clear of compatriots Dustin Johnson, Xander Schauffele and Brooks Koepka. Woods’ latest Green Jacket brings his tally of Major titles to 15, but none have been more celebrated than today’s victory in Georgia. The success caps a tremendous seven months which saw him also capture the Tour Championship last September. His win on Sunday ended a major drought stretching back to 2008 and Woods celebrates his first Masters victory since 2005. The tension ratcheted up as the tournament neared its conclusion, with five players sharing the lead at 12-under par before Woods birdied the 15th to pull clear. The triumph was the first major victory for Woods when he did not lead after 54 holes, having started the day adrift of reigning British Open champion Molinari. Woods drove the green in two at the par-5 15th and tapped in for birdie to seize the lead alone at 13-under par then sank a four-foot birdie putt at the par-3 16th to stretch his advantage to two shots with two holes remaining. Woods, one shy of matching Nicklaus for the most career Masters wins (6), won his 81st career US PGA victory, one shy of the all-time record held by Sam Snead. Woods, Molinari, Schauffele, Kopeka and Johnson — with Australian Jason Day in the clubhouse on 11-under and Patrick Cantlay, who also hit 12-under, foiled by bogeys at 16 and 17. Email “Tiger Woods rolls back the years to claim stunning Masters victory”. Feedback on “Tiger Woods rolls back the years to claim stunning Masters victory”.